My telephone-based language test has been scheduled for May 13. If I pass, I will earn .17 points. That seems like a small payoff, but if I were on the Register, with my “raw” score from the Oral Assessment, I would be in the lower third of the list. People at that position often never receive a job offer. This language bonus would bump me up from the lower third to the upper third of the list, with a better chance of getting an offer. This test only scores for level 2 of the proficiency scale. If I pass this test, then I will be eligible to go to Washington DC and take an in-person reading and speaking test, which tests for higher levels. If I score at level 3 on that test, then I will get an additional .25 points. That bonus would put me into the top 10 of the Registry list, and would probably ensure that I would get “the call” for the next round of hires. But I first have to pass this test. I’m not too concerned about performing well on the test, because I’ve been a Mandarin speaker for over half my life. However, I’ve never had my Chinese language skills formally assessed. I don’t have doubts about my language ability, but because the stakes are so high, I have a little test anxiety. 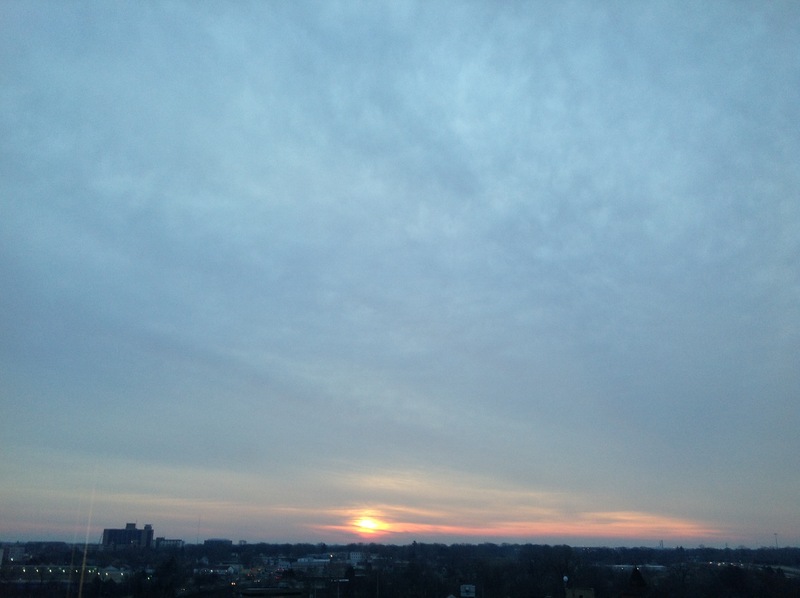 The sun is rising earlier now, so it’s harder to capture the sunrise. 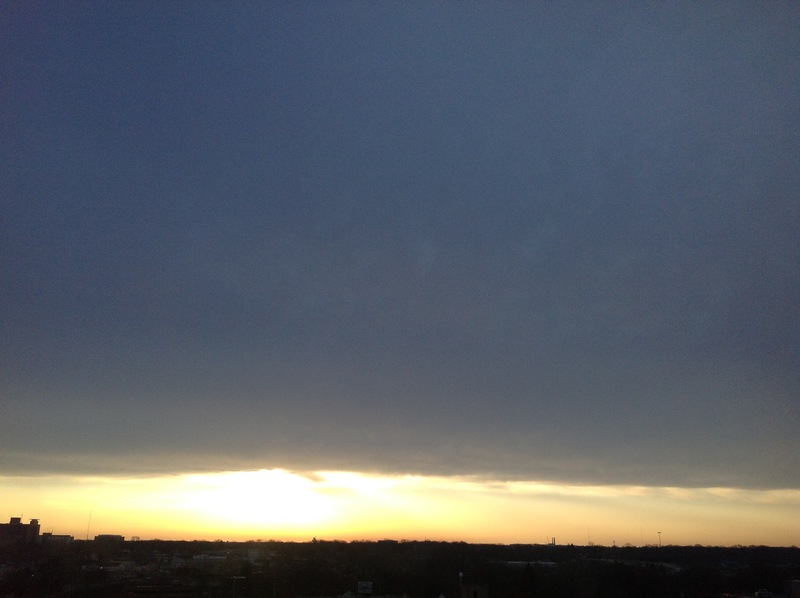 This might be the last sunrise picture from the office window. Even though I freely admit that there are severe gaps in my knowledge, I nevertheless consider myself to be intelligent and well-educated, with a better-than-average vocabulary. However, I have been defeated by a book. “Blood Meridian” by Cormac McCarthy is a frustrating read, because every paragraph seems to contain more than one word that I have never seen before, and that I can’t guess the meaning of through the context. The book is on my Kindle, which is helpful, because I can point to words, and the built-in dictionary shows a gloss at the bottom of the screen. But about half of the words that I look up in Blood Meridian are not in the dictionary. I tried skipping over the words, but that didn’t help. McCarthy’s prose links so many phrases together with conjunctions that the sentences in the book are often a paragraph long. It’s hard enough following such a long sentence when I understand the words that I’m reading. When I have to mentally hold place markers for unknown words, reading becomes an unenjoyable task. My disappointment with the book is aggrevated by the praise that others have given it. I persevered with Blood Meridian much longer than I would normally do, because so many people have said such great things about the book. That disconnect between their appreciation for the book and my own experience only made my difficulty with it more frustrating. 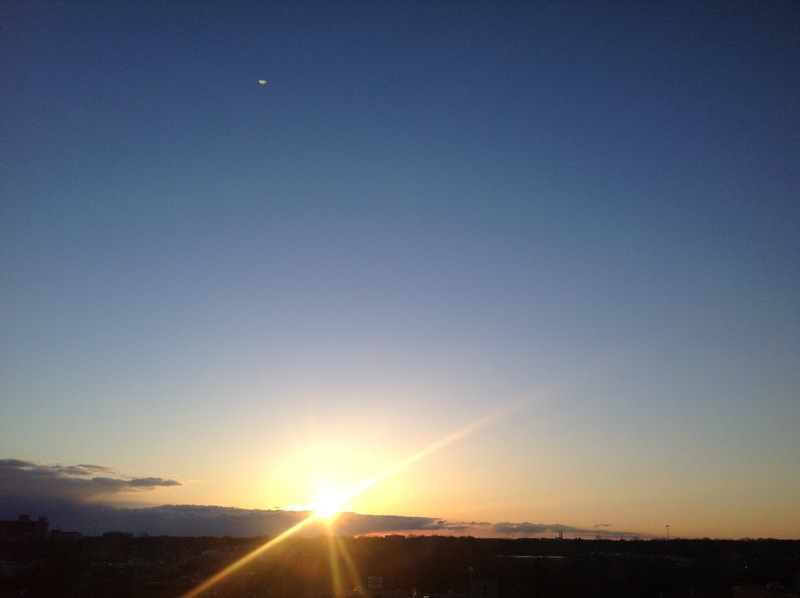 Finally, last night, I decided that the benefit wasn’t worth the struggle. I deleted the book from my Kindle. I usually fire books because they are poorly written or don’t hold my interest. With this book, I don’t feel like I’m firing it; I feel like I’m quitting. I guess that I now have a greater appreciation for the frustration that poor readers have when trying to read. The cost of understanding how other people may struggle with reading is too high, though. Reading should be a pleasurable and/or educational experience. Reading should not make one feel stupid. If McCarthy’s motivation was to show that his vocabulary is greater than the average person, then he succeeded. If his motivation was to get me to read his book, he failed. I was wondering about the status of my security clearance, so I called the Security Clearance Support Help Desk at the State Department (yes, that is a thing). I got voice mail, so I left a message, and wasn’t expecting to get a return phone call, because, you know, it’s the government. Well, at 7:00 this evening, they called me back, surprise surprise! The status is that the background investigation is still ongoing. I said that the investigator who interviewed me (for seven hours) had submitted his report. Yes, was the answer, but there is a “plethora of investigators on your case” (direct quote). 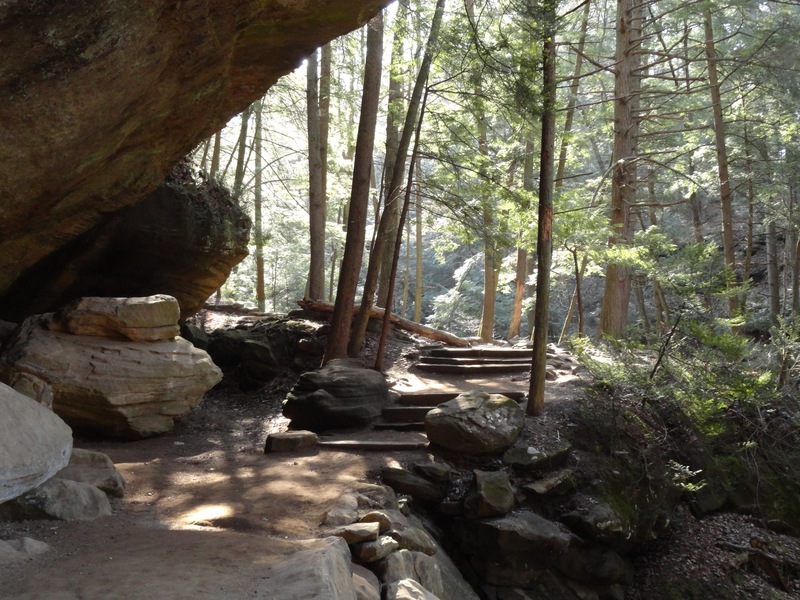 Hocking Hills State Park in Ohio is a geologically unique environment. 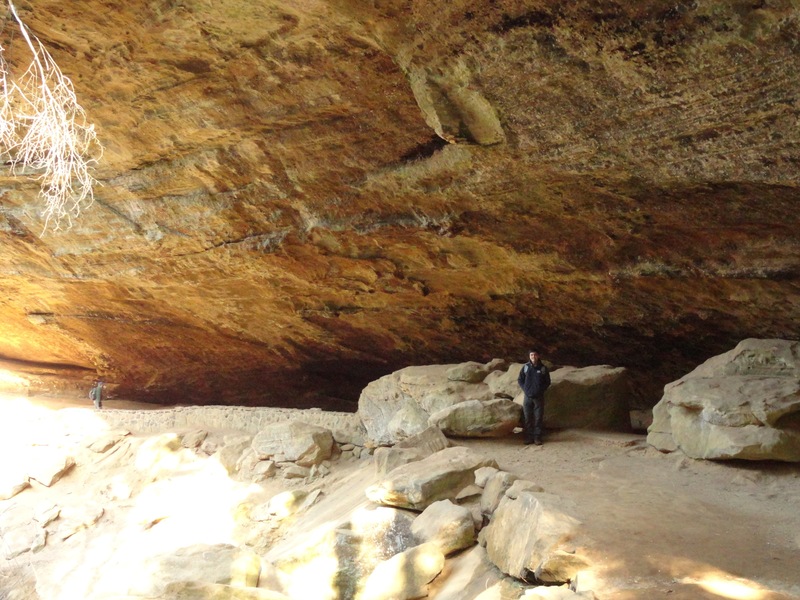 Sandstone formations were eroded by ground water to produce interesting rock formations and caves. We spent a few days hiking the trails in the park. 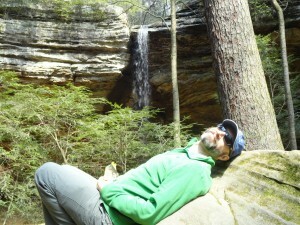 It was in early April, so the spring foliage wasn’t out yet, but the scenery was still beautiful. 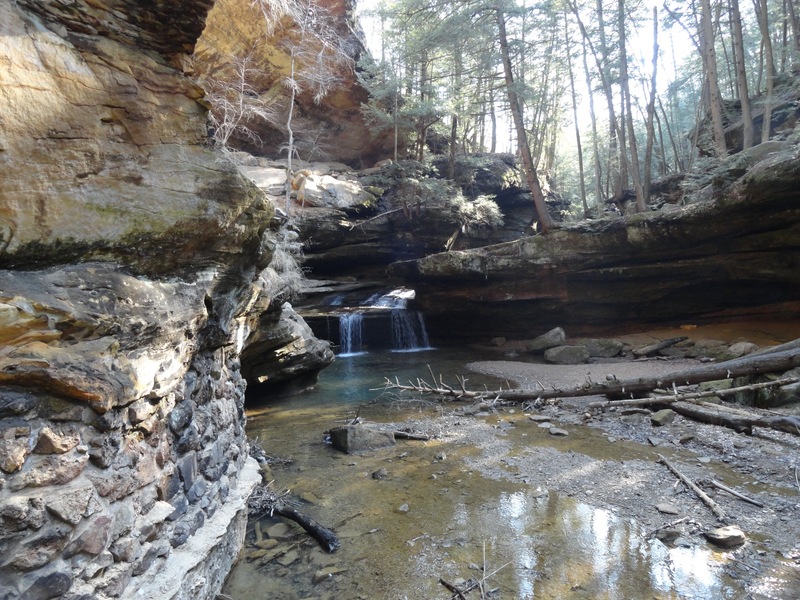 Old Man’s Cave is a huge natural amphitheater with a stream and small waterfall at the foot. 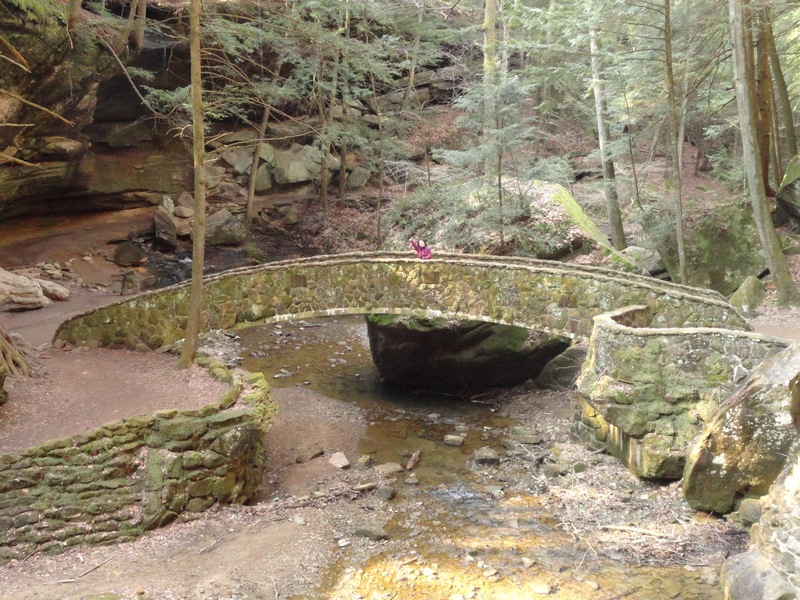 A stone bridge begins the trail from Old Man’s Cave to Cedar Falls. The trail is a little rough. Wear good hiking boots if you want to take the trails. We lost count of the number of waterfalls that we saw. 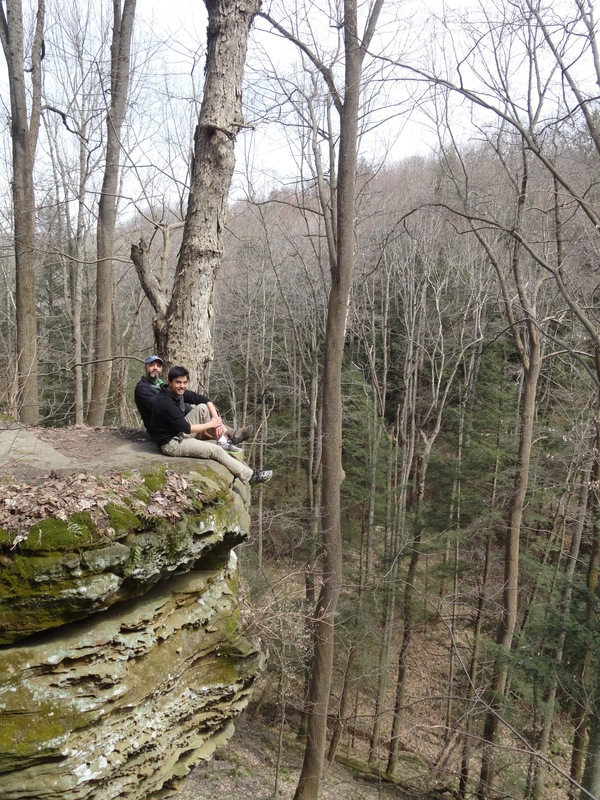 I was surprised that it was possible to sit on the edge of a 100-foot cliff in the park. Most public parks have guardrails to prevent you from being stupid like this. 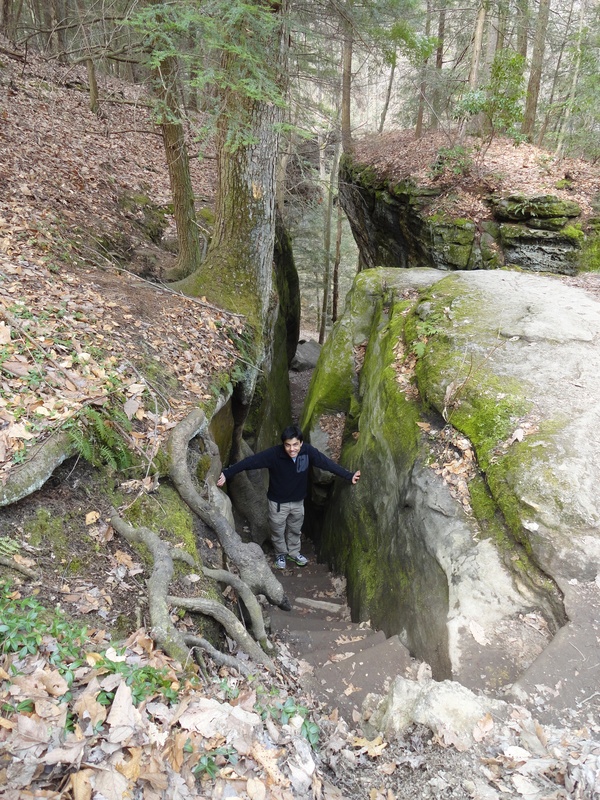 You need strong legs and knees if you want to see everything in the park – there’s lots of climbing! 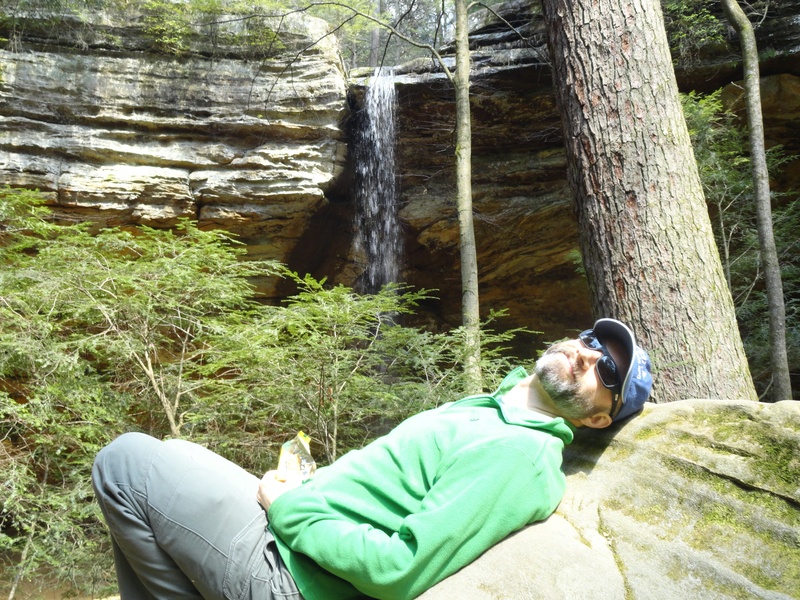 We hiked about 14 miles in one day (Stacy thinks it’s closer to 17). The Grandma Gatewood trail is officially 12 miles long, but we got lost at one point and walked about an hour to get back on the trail. 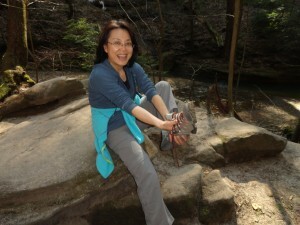 The weather was perfect for hiking: sunny and cool (upper 50s). By the end of the day, we were tired and a little sore, but blister-free! 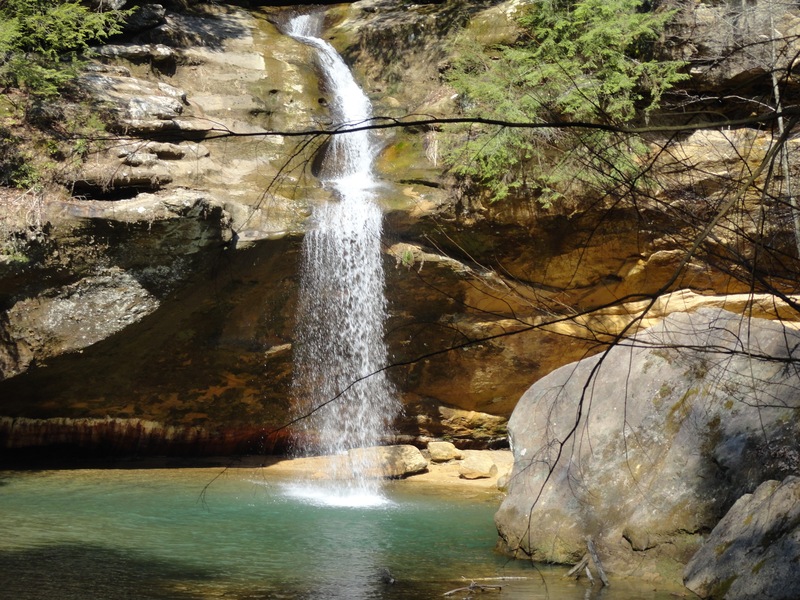 If you’re into nature, geology and hiking, add Hocking Hills State park to your list. It was worth the five-hour drive to get there. I just received notice that Ian’s and Evan’s medical clearances came through. Stacy’s hasn’t come through yet, possibly because of a small complication with her medical exam. He has a long-standing health issue related to her having grown up in another country. Our family doctor says that it isn’t a problem, but I’m not surprised that the staff in the State Department’s medical office will scratch their heads over it for a few minutes. I sent Evan’s information in on March 24th. One week to clearance. That’s pretty speedy, by US Government standards, and much faster than I had thought it would be.